A High Powered Committee set up by the Central government has suggested that allocation of natural resources should go to the highest bidder. This 13-member committee, headed by former finance secretary Ashok Chawla, submitted its recommendations in the first week of June. It was set up in January in the backdrop of recent cases of illegal mining, 2G spectrum scam and debates surrounding pricing of natural gas. Its aim was to suggest a roadmap for enhancing “transparency, efficiency and sustainability in the allocation, pricing and utilisation of natural resources”. The committee, which comprises bureaucrats and industry representatives, including the Confederation of Indian Industry and the Federation of Indian Chambers of Commerce and Industry, makes a number of recommendations to avoid corruption and ensure transparency in the system. These include introducing market-based competitive mechanisms into the policy framework governing fossil fuels, minerals, telecom spectrum and ecological resources, including forests, water and land. But it discounts how to tap the resources in a sustainable manner. To avoid delay in forest clearances, the committee recommends that state forest departments should build up their capacities. It also suggests classifying forests on biological and geo-climatic parameters, and accordingly make some of them “inviolate”. This would improve “predictability of clearances”, the report says. The catch is declaring a forest “inviolate” does not rule out its diversion; it may still be diverted for what the committee terms “defined set of limited circumstances”. The committee does not address problems like red-tapism which hinder forest clearance, says Shankar Gopalakrishnan of Campaign for Survival and Dignity. It is a federation of forest dwellers and tribals’ organisations from 11 states. The committee’s recommendations are just aimed at expediting the forest clearance process. It seems to be saying “let’s pay and take”, Gopalakrishnan says. The committee members do not seem to have any concept of forest dwellers or people dependent on forests. Though the report says public consultations should be done, it does not give the public the decisive power, he adds. In what is termed a regressive step, the report says degraded forests should be de-reserved and allowed to be diverted. “Millions of people depend on degraded forests that cover 40 per cent of open forests (forest with low tree cover),” says Chandra Bhushan, deputy director general of the Centre for Science and Environment, a non-profit in Delhi. This is also in contradiction with the National Mission for a Green India. One of its objectives is to reclaim degraded forests, he says. The report is silent on allocation of water for industrial use, which has grown unregulated in the last decade. By the National Commission on Integrated Water Resources Development’s reckoning, 37 billion cubic metres (bcm) of water was diverted for industries in 2010. This is almost double the country’s domestic water use. The demand will increase to 67 bcm by 2025 and 81 bcm by 2050. Such large allocation of water for industries competes with the daily needs of people. “The committee should have looked at market mechanism for increasing cess on water that stands at a paltry 10-20 paise per 1,000 litres,” says Bhushan. While recommending measures for efficient allocation of land, the committee confines its report to government land. It says the government should inventorise its land and make the list publicly available. It can earn a “higher income in the form of ground rent”, by regularly updating the rates in line with the market rate, the report suggests. Land rights activist Medha Patkar says the recommendations are a mockery of the purpose for which the committee was set up. There is no suggestion for communities, even though their resources are being exploited for massive gains. People whose land is taken for projects should be treated as investors, she says. Calling New Exploration Licensing Policy (NELP) for petroleum a “benchmark for transparency in the natural resources sector”, the committee recommends similar mechanism for natural gas and coal. It recommends shifting to market-based pricing for metals, minerals and other fossil fuels. For instance, an Empowered Group of Ministers (EGoM) decides the price of natural gas. Its price is subsidised for the fertiliser sector to keep fertiliser subsidy under control. The committee says the government should directly subsidise fertilisers for farmers and shift to market-based pricing of gas. The move towards market pricing may not check corruption, warns E A S Sarma. “The natural gas market is highly fragmented (with many diverse buyers). So it is necessary to leave it to a statutory regulator to determine the price. Unfortunately, it is the EGoM that decides the price. This has given enormous scope for rent-seeking in the government,” he adds. The committee points out, Centre-owned Coal India Limited determines coal prices to check electricity tariffs. The state governments further subsidise the tariff. Instead of the government deciding the price of coal and giving priority to sectors like the power sector, it should allow all industries to buy coal. This would let the market determine the coal price. The Chawla committee also proposes that captive coal miners should be allowed to sell the fossil fuel in the market (see ‘Coal blocks revert’, Down To Earth, November 1-15, 2009). “This would mean windfall gain for captive mine holders, who account for about 50 per cent of the allocated coal blocks,” says Bhushan. The earlier version of the draft (with Down To Earth) favoured a special royalty on these sales by private captive coal block owners. It was done away with in the final report. 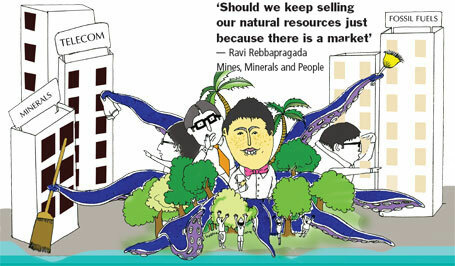 “Should we keep selling our natural resources just because there is a market?” says Ravi Rebbapragada of Mines, Minerals and People, a non-profit in Andhra Pradesh. The report is casual about land and minerals, he adds. They do not take into account the Fifth and Sixth schedule regions, which are mostly inhabited by tribal people and are home to most of the country’s mineral resources. They lack an inclusive development approach. The host population should be given equity in some form to encourage development, he says. Markets do not place a premium on the value of minerals for their depletability, says Sarma, nor do they fully account for fallouts like pollution and displacement of people. While promoting a market-based mechanism, the Chawla committee’s recommendations do not cover these aspects. If purely market-driven terms are to be adopted, the country will be frittering away its precious mineral resources cheaply and destroying its own ecology to benefit consuming countries, he adds. And next would be a high powered committee consisting of Ministers,CII,some Bureaucrats and some recommendations from 10, Janpath........to value the boundaries of our country.